So With a more compliant spring and some leather it will be happy days.Tomorrow I'll start on the rest of the tin work and the rear guard trimming. Not to much padding don't want to spoil the look!!!!!!!!!!!!!!!!!!!!!!!!!!!!!!!!!!! I reckon leather only brother no padding at all...It's got a spring but it is comfy as the way it is. Start a thread bud...I for one would be very interested. Ive raced one of them before at a fair that came to school once and it was the first time i had sat in one. I smashed the rest of them cos i used to race touring bikes back then too so i had muscle endurance on my side, but they were great fun drifting in the grass around the circuit. 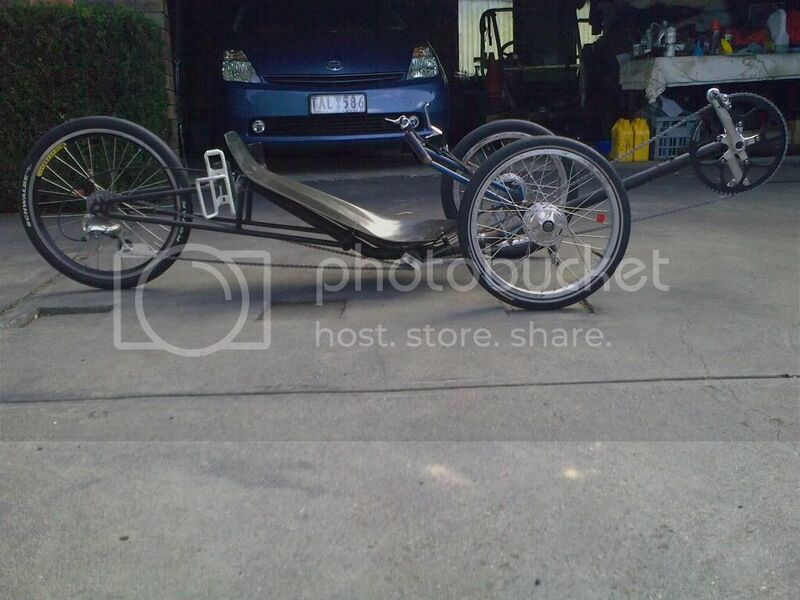 Ive always wanted to buy one to ride to work and back, reckon they would be fun as you can get around pretty quick surprisingly with such a small driven wheel. Way too wasted to even think about anything now but more Jimmy cans...Bung. Ha ha ha Anyway I got some more sheet metal for the inlay and the rear guard so if I feel up to it I'll knock it over tomorrow arvo so I can brake it down and send it off for sand blasting on Friday. I reckon you could get away with putting some bigger padding on this one Rob. It would fill up the V where the seat is nicely. Well I b*tched out and had a camp this PM instead of working on the bike...LOL Getting too old to play up. Anyway will get the rest of it done I hope to morrow or Saturday then off to the blaster then onto paint.Need to find a leather man to do the seat for me now in the style I want too. Got the inlay done today but nothing else,after that.Still if I finish early enough tomorrow arvo I'll finish the drop outs and brake it down for the blaster. Getting there Rob, love the vertical weld mate, very impressive. Nice work! Enjoy your day at wotk today, i might go to the pub for lunch! Edited by deankdx, 29 May 2011 - 10:47 AM. Edited by xm-221, 29 May 2011 - 10:40 AM. ha.....sorry wasnt familiar with the rules. It's push bike bro,not a motor bike. If It was a motor bike it would not have pedals or cranks.